We've extended the £1 Coventry city hop to include Fargo Village, as well as the existing journeys within the Ring Road and Rail Station. If you want to quickly jump on a bus and make a single journey wholly within the Ring Road in Coventry or a little bit further to Fargo Village, or to or from the Rail Station, you only have to pay £1! You can catch services 8, 8A, 9, 9A from the train station to anywhere in the city centre and only pay £1! Travelling from Pool Meadow Bus station to the city centre; only pay £1! 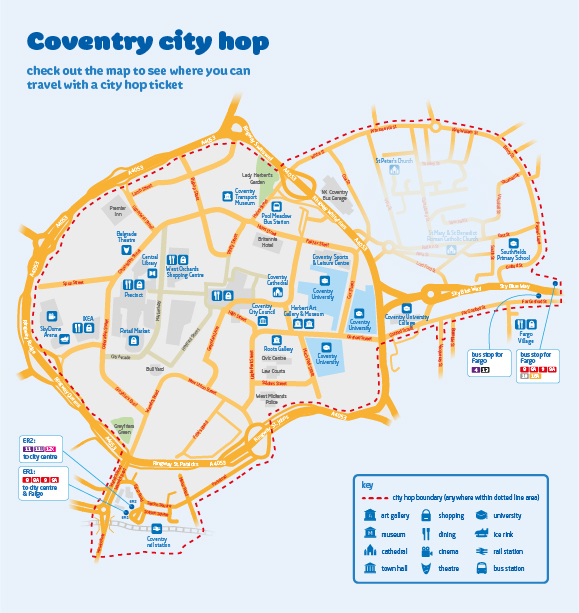 Coming from the Sky Dome or IKEA to the Bus Station simply catch service 6, 6A, 8, 8A, 9, 9A, 10, 18, 18A or 21 and ask for a Coventry City Hop and only pay £1! All fares sold subject to the Company's Conditions of Carriage. Prices and conditions correct as at January 2017 but subject to alteration without notice.